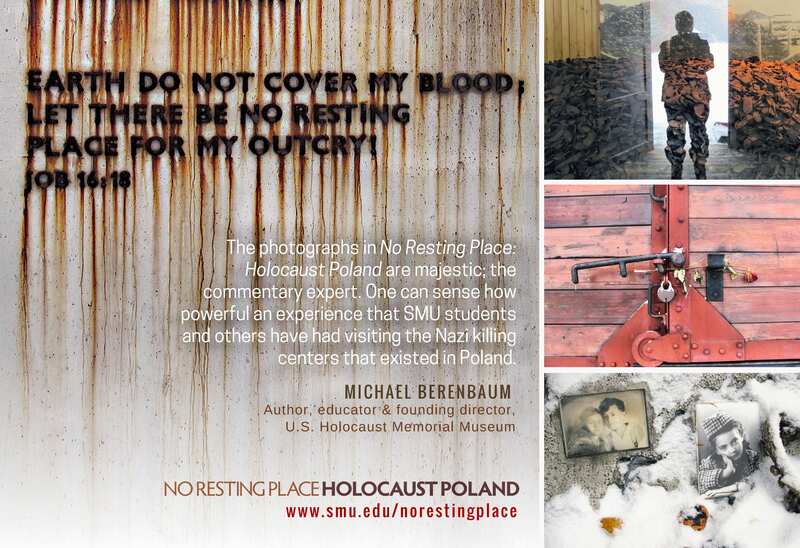 DALLAS (SMU) – The SMU Embrey Human Rights Program’s new book No Resting Place: Holocaust Poland has won an international Gold Award for “Best Design” from the Council for Advancement and Support of Education (CASE). CASE Circle of Excellence awards recognize outstanding work in advancement initiatives from member institutions in 82 countries. For the 2018 competition, CASE received 3,204 entries in a range of categories, and bestowed only 100 gold honors. 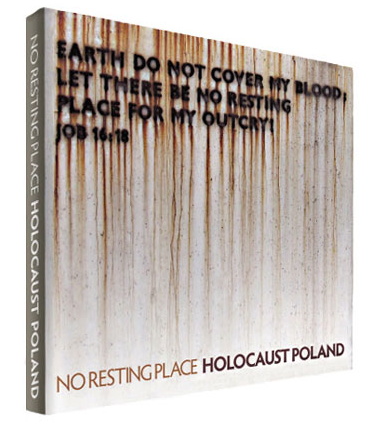 No Resting Place: Holocaust Poland was produced to commemorate the 20th anniversary of its “Holocaust Poland” trip – one of the longest running, most comprehensive Holocaust study abroad trips offered by a U.S. university. The artfully and sensitively designed large-format book bears witness to the deep physical and emotional scars that linger in Poland after the Nazis forced the country to become the epicenter of the Holocaust. During World War II, about one-third of the Holocaust’s 11 million victims would be murdered by German Chancellor Adolf Hitler’s SS to fulfill the mission of the genocidal Third Reich. The book provides readers with an inside look at 13 of Nazi-occupied Poland’s most notorious killing fields and forests, ghettoes, prisons, and concentration and labor camps – six designed solely for extermination – through more than 200 contemporary photographs, historical vignettes and poignant personal observations shared by all those who have experienced the immersive, life-changing trip. To commemorate the Embrey Human Rights Program’s first decade, and the “Holocaust Poland” trip’s second, program director Rick Halperin teamed up with SMU colleagues Sherry Aikman and Denise Gee to produce a sensitively crafted book depicting what it’s like to witness “the last places ever seen by millions of innocent people who didn’t want to die in such horrific places,” says Halperin, who has taught history and human rights at SMU for more than 30 years. 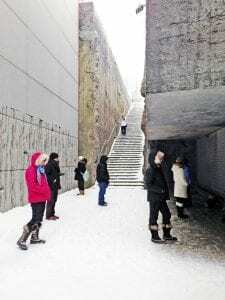 The “Holocaust Poland” trip, held annually the last two weeks of December, is the cornerstone of EHRP travel opportunities. Since EHRP Director Halperin began leading the trip for SMU in 1996, the pilgrimage has grown from only a few participants to, as of the 2017 trip, more than three dozen. “Holocaust Poland” trip participants embark on an emotionally and physically taxing pilgrimage, during which intense feelings of grief and disbelief are juxtaposed with encouraging stories of resistance, friendship and survival. Most trip-goers vow to become agents for global peace and justice, but in 2005, one “Holocaust Poland” pilgrim — Dallas philanthropist and SMU alumna Lauren Embrey (’80, ’06) – would go even further. Embrey was so moved by the trip, as well as her human rights-related graduate-level coursework, that she and her sister, Gayle, generously provided the opportunity for thousands of future SMU “world changers” to be equally inspired and educated. In 2006, the Embrey Family Foundation funded the ground-breaking Embrey Human Rights Program in SMU’s Dedman College of Humanities and Sciences. The program – led by Halperin, with the credo “there is no such thing as a lesser person” – offers an interdisciplinary mix of innovative curricula, public learning events and engaged-learning trips while also supporting student-led community outreach and activism. By 2012 the program’s popularity resulted in the creation of a unique Bachelor of Arts in Human Rights, making SMU only a handful of universities in the nation to offer such a degree (as well as a Master of Liberal Studies degree in social justice and human rights). “As one of only seven U.S. universities to offer a major and minor in human rights, SMU is inspiring a new generation of world changers to understand and defend the dignity of all people thanks to the Embrey Human Rights Program,” says Dedman College Dean Thomas DiPiero. CASE Circle of Excellence Gold Award winners will be on display July 15-17 at CASE’s Summit for Leaders in Advancement in New York City. Award winners also will be recognized during the CASE Europe Annual Conference in late August and in 2019, at the annual CASE Asia-Pacific Conference in March. For the complete list of 2018 Circle of Excellence award winners, www.case.org/circle. And for more details about SMU’s Embrey Human Rights Program, visit smu.edu/humanrights, drop by Clements Hall Room 109, or contact 214-768-8347/humanrights@smu.edu. • To review & order the book, visit smu.edu/norestingplace. • To request high-resolution images, or an interview with SMU Embrey Human Rights Program Director Rick Halperin, contact Kim Cobb at cobbk@smu.edu.